In one of the last posts we have looked at how to plot equipotential lines. Here we want to plot the equipotential lines of two sources with different charges, like an electron and a positron. In addition the sources should be plotted as well, as can be seen in Fig. 1. 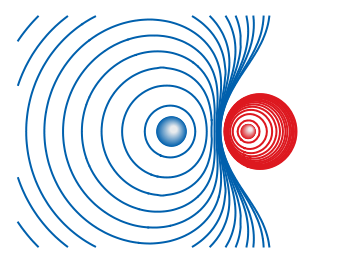 There the electron is drawn as a red sphere with some lightning effect and the positron as a red sphere. 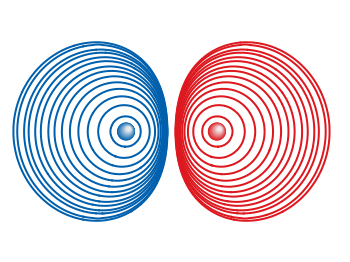 This effect can be achieved with Gnuplot by plotting a bunch of circles with slightly different color and size on top of each other. The size and position are determined by the posx,poxy,size functions. The color is chosen according to the blue function for the electron, which is a little tricky and composed of the three color functions r,g,b. These functions generate a color gradient starting from the blue, which is used as the line color for the equipotential lines, into a slight white. The code shown so far is put into external functions (electron.gnu, positron.gnu) and can be used in any script to plot equipotential lines, as the one used to generate Fig. 1. The position and size of the source are the parameters of the functions. Fig. 2 shows the result for a negative particle with twice the absolute charge of the positive charged particle. Thanks to Gnuplotter for the original idea. Thanks for your comments, I have changed the text and the code accordingly in order to fix this.